If you have a list of data that you want to group and summarize, you can create an outline of up to eight levels, one for each group. Each inner level, represented by a higher number in the outline symbols, displays detail data for the preceding outer level, represented by a lower number in the outline symbols. Use an outline to quickly display summary rows or columns, or to reveal the detail data for each group. You can create an outline of rows (as shown in the example below), an outline of columns, or an outline of both rows and columns. 1. To display rows for a level, click the appropriate outline symbols. 2. Level 1 contains the total sales for all detail rows. 3. Level 2 contains total sales for each month in each region. 4. Level 3 contains detail rows — in this case, rows 11 through 13. 5. To expand or collapse data in your outline, click the and outline symbols. Make sure that each column of the data that you want to outline has a label in the first row, contains similar facts in each column, and that the range has no blank rows or columns. Use the Subtotal command, which inserts the SUBTOTAL function immediately below or above each group of detail rows and automatically creates the outline for you. For more information about using the Subtotal function, see SUBTOTAL function. Insert your own summary rows, with formulas, immediately below or above each group of detail rows. For example, under (or above) the rows of sales data for March and April, use the SUM function to subtotal the sales for those months. The table later in this topic shows you an example of this. Specify whether the summary rows are located below or above the detail rows. On the Data tab, in the Outline group, click the Outline dialog box launcher. If your summary rows are above your detail rows, clear the Summary rows below detail checkbox. Otherwise, leave the checkbox alone. If necessary, select a cell in the range of cells you want to outline. On the Data tab, in the Outline group, click the arrow under Group, and then click Auto Outline. Important: When you manually group outline levels, it's best to have all data displayed to avoid grouping the rows incorrectly. Select all of the subordinate summary rows and their related detail rows. For example, in the data below, row 6 contains the subtotal for rows 2 through 5, and row 10 contains the subtotal for rows 7 through 9, and row 11 contains the grand total. To group all of the detail data for row 11, select rows 2 through 10. Important: Do not include the summary row (row 11) in the selection. On the Data tab, in the Outline group, click Group, click Rows, and then click OK. The outline symbols appear beside the group on the screen. Optionally, outline an inner, nested group — the detail rows for a given section of your data. For each inner, nested group, select the detail rows adjacent to the row that contains the summary row. In the example below, to group rows 2 through 5, which has a summary row 6, select rows 2 through 5. To group rows 7 through 9, which has a summary row 10, select rows 7 through 9. Important: Do not include the summary row in the selection. On the Data tab, in the Outline group, click Group. Continue selecting and grouping inner rows until you have created all of the levels that you want in the outline. 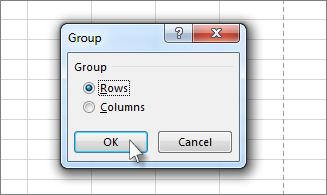 If you want to ungroup rows, select the rows, and then on the Data tab, in the Outline group, click Ungroup. You can also ungroup sections of the outline without removing the entire outline. Hold down SHIFT while you click the or for the group, and then on the Data tab, in the Outline group, click Ungroup. Important: If you ungroup an outline while the detail data is hidden, the detail rows may remain hidden. To display the data, drag across the visible row numbers adjacent to the hidden rows. On the Home tab, in the Cells group, click Format, point to Hide & UnHide, and then click Unhide Rows. Make sure that each row of the data that you want to outline has a label in the first column, contains similar facts in each row, and the range has no blank rows or columns. Insert your own summary columns with formulas immediately to the right or left of each group of detail columns. The table listed in step 4 below shows you an example. Note: To outline data by columns, you must have summary columns that contain formulas that reference cells in each of the detail columns for that group. Specify whether the location of the summary column is to the right or left of the detail columns. On the Data tab, in the Outline group, click the Outline dialog box launcher. On the Data tab, in the Outline group, click the Outline dialog box launcher. To specify a summary column to the left of the details column, clear the Summary columns to right of detail check box. To specify a summary column to the right of the details column, select the Summary columns to right of detail check box. If necessary, select a cell in the range. On the Data tab, in the Outline group, click the arrow below Group and click Auto Outline. Important: When you manually group outline levels, it's best to have all data displayed to avoid grouping columns incorrectly. Select all of the subordinate summary columns, as well as their related detail data. In the example below, column E contains the subtotals for columns B through D, and column I contains the subtotals for columns F through H, and column J contains the grand totals. To group all of the detail data for column J, select columns B through I. Important: Do not include the summary column J (the grand totals) in the selection. Optionally, outline an inner, nested group (individual groups of detail columns). For each inner, nested group, select the detail columns adjacent to the column that contains the summary column. In the example below, to group columns B through D, which has a summary column E, select columns B through D. To group columns F through H, which has a summary row I, select columns F through H.
Important: Do not include the summary column for that group in the selection. Continue selecting and grouping inner columns until you have created all of the levels that you want in the outline. If you want to ungroup columns, select the columns, and then on the Data tab, in the Outline group, click Ungroup. If you don't see the outline symbols , , and , click the Microsoft Office Button and then click Excel Options (Excel 2007), OR, click the File tab (other versions), and then click Options, click the Advanced category, and then under the Display options for this worksheet section, select the worksheet, and then select the Show outline symbols if an outline is applied check box. To display the detail data within a group, click the for the group. To hide the detail data for a group, click the for the group. In the outline symbols, click the number of the level that you want. Detail data at lower levels is then hidden. For example, if an outline has four levels, you can hide the fourth level while displaying the rest of the levels by clicking . To show all detail data, click the lowest level in the outline symbols. For example, if there are three levels, click . To hide all detail data, click . For outlined rows, Microsoft Excel uses styles such as RowLevel_1 and RowLevel_2 . For outlined columns, Excel uses styles such as ColLevel_1 and ColLevel_2. These styles use bold, italic, and other text formats to differentiate the summary rows or columns in your data. By changing the way each of these styles is defined, you can apply different text and cell formats to customize the appearance of your outline. You can apply a style to an outline either when you create the outline or after you create it. Select the Automatic styles check box. Select the cells that you want to apply outline styles to. You can also use autoformats to format outlined data. If you don't see the outline symbols , , and , click the Microsoft Office Button and then click Excel Options (Excel 2007), OR the File tab (other versions), and then click Options, click the Advanced category, and then under the Display options for this worksheet section, select the worksheet, and then select the Show outline symbols if an outline is applied check box. Use the outline symbols , , and to hide the detail data that you don't want copied. For more information, see the section, Show or hide outlined data. Select the range of summary rows. On the Home tab, in the Editing group, click Find & Select, and then click Go To. Click OK, and then copy the data. Note: No data is deleted when you hide or remove an outline. (Excel 2007) Click the Microsoft Office Button and then click Excel Options OR the File tab (other versions), and then click Options, click the Advanced category, and then under the Display options for this worksheet section, select the worksheet that contains the outline you want to hide and clear the Show outline symbols if an outline is applied check box. One the Data tab, in the Outline group, click Ungroup and click Clear Outline. Important: If you remove an outline while the detail data is hidden, the detail rows or columns may remain hidden. To display the data, drag across the visible row numbers or column letters adjacent to the hidden rows and columns. On the Home tab, in the Cells group, click Format, point to Hide & Unhide, and then click Unhide Rows or Unhide Columns. For more information, see the sections Create an outline of rows or Create an outline of columns. Select the summary data that you want to chart. For example, to chart only the Buchanan and Davolio totals, but not the grand totals, select cells A1 through C11 as shown in the above example. Create the chart. For example, on the Insert tab, in the Charts group, click Recommended Charts, or choose another chart type. For example, if you create the chart by using the Chart Wizard, it would look like the following example. If you show or hide details in the outlined list of data, the chart is also updated to show or hide the data. 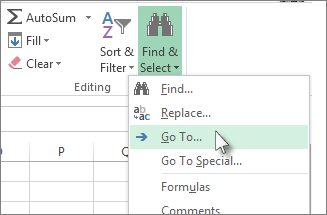 You can group (or outline) rows and columns in Excel Online. Note: Although you can add summary rows or columns to your data (by using functions such as SUM or SUBTOTAL), you cannot apply styles or set a position for summary rows and columns in Excel Online. Select the data (including any summary rows). On the Data tab, in the Outline group, click Group > Group Rows. Optionally, if you want to outline an inner, nested group — select the rows within the outlined data range. Select the data (including any summary columns). On the Data tab, in the Outline group, click Group > Group Columns. Optionally, if you want to outline an inner, nested group — select the columns within the outlined data range. To ungroup, select the rows or columns, and then on the Data tab, in the Outline group, click Ungroup and select the appropriate option.